* One of the most distinctive parts about the Galician accent on the western coast (i.e., where I work) is the gheada phenomenon, where the G sound ends up being a throaty KH or H sound. For example, whenever my preschool students finish with a worksheet, a lot of them will ask me, “¿qué fago?” which means, “What do I do next?” but the way they pronounce it makes it sound like “kay FAH-khoe” [ke ˈfa.ħo]. Galician comic artist Luis Davila often depicts characters speaking with a gheada accent, and uses the Spanish letter J to represent the sound (think the sound in jamón or jalapeño). In the comic below, delgada (“skinny”) and agraria (“agrarian”) are changed to deljada and ajraria to reflect how people in western Galicia would talk. Elsewhere people use the GH instead of the J the same way. * Another unique part about the western Galician accent is seseo, something that also happens in some Andalusian accents and all of Latin American Spanish. Whereas in the standard Castilian accent (and Galician, too!) you pronounce zapatos (“shoes”) as “thah-PAH-toes” [θaˈpa.tos], if you sesear, you say “sah-PAH-toes” [saˈpa.tos] instead. My preschool kids will ask for ceras (“crayons”) and say “SAY-rahs” [ˈse.ɾas] and talk about their zumo (“juice”) and say “SOO-moe” [ˈsu.mo]. Instead of distinguishing between the S and C/Z sounds, people pronounce them all the same. * Despite being a tiny region half the size of the U.S. state of West Virginia, there’s a lot of dialect differences when it comes to vocabulary. For example, the word for “hand” is man in the west and mao in the east (cf. Portuguese mão), “mother” is nai in some parts and mai in others, and every so often you’ll hear patacas instead of the standard patatas for “potatoes.” The real fun happens when you have totally unrelated words that mean the same thing, like hórreo, cabazo, and canastro which all refer to the same typical granite-and-wood-roof corncrib you see all over the region. * Apparently Galicians use a handful of Spanish words when speaking Galician and almost never use their technical Galician equivalents. Galician-style octopus is called pulpo á feira, rarely polvo á feira (it’s pulpo in Spanish) and my English teacher says only politicians use the word nembargantes (“however”) instead of sen embargo (it’s sin embargo in Spanish). * A vocal minority of speakers consider Galician and Portuguese the same language, and try to write Galician as if it were Portuguese—the lusistas. You’ll often see nationalist graffiti on walls crying for independência (versus the standard, circumflex-less independencia), referring to women as mulher instead of muller, and em Galiza e em galego (standard Galician would be en Galicia e en galego). 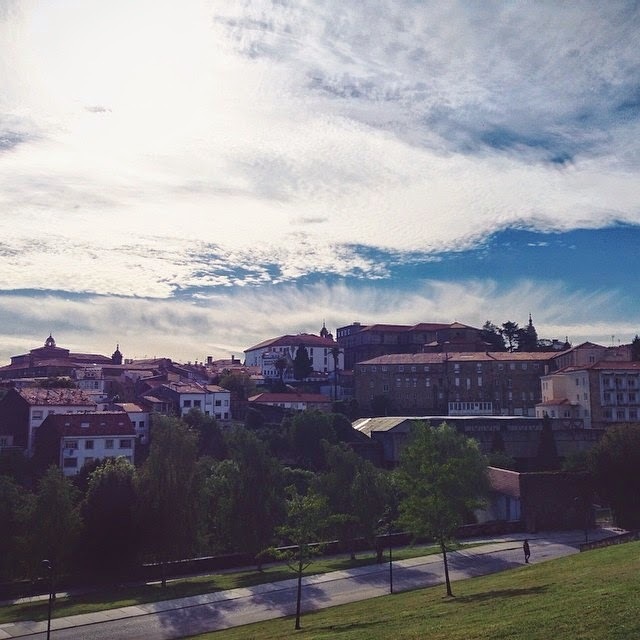 * The vast majority people here can understand and speak Galician but there are many families who only speak Castilian Spanish with each other. * Contractions in this language are out of control. To say “I already told you it,” you say xa cho díxen, which if you break it out: xa (“already”) che (“to you”) o (“it”) dixen (“I said/told”). Here the che + o = cho. Wiktionary has a wonderful chart breaking down this confusing aspect of the language. * Galician is NOT a mixture of Spanish and Portuguese; if it were, it would be considered a pidgin or creole language due to contact between the two languages…but it isn’t. It’s what evolved over 2,000 years from the native Vulgar Latin that was once spoken in Roman Gallaecia. * BUT it and Portuguese were once the same language in the Middle Ages. After the County of Portugal broke free from the Kingdom of León in 1143, the two dialects began to go their separate ways, with Galician gaining more of a Castilian flair due to influence from Spain over the years. 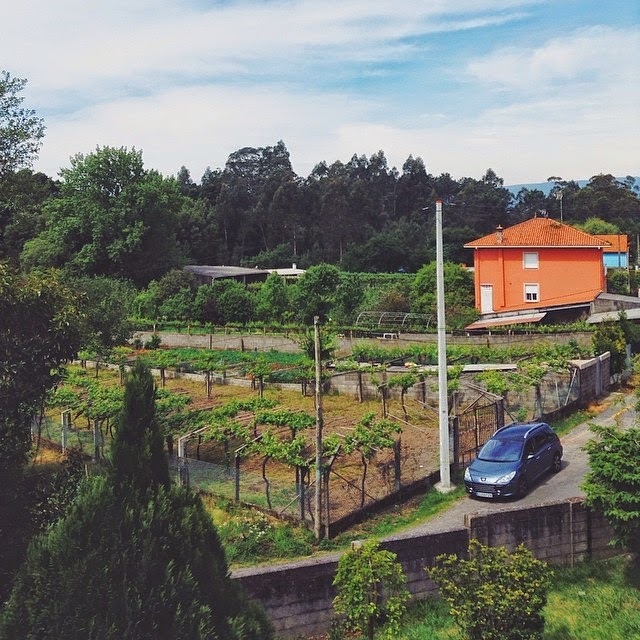 Nevertheless, in towns along the southern border of Galicia there’s kind of a transition zone between Galician and Portuguese, especially in Tui (Spain) and Valença do Minho (Portugal). * And there’s still a high degree of mutual intelligibility between Galician- and Portuguese-speakers. My teachers always tell me, however, that it’s easier for them to understand Brazilians than their Portuguese neighbors! * Where Portuguese and Spanish have the /kw/ sound (think cuatro “four” and cuando “when”) Galician just has /k/ (catro and cando). * Galician plurals are actually more complex than just adding -S, as I thought incorrectly a few months ago. While the plural of constitución is, indeed, constitucións, if a word ends in a fricative like -S or -Z, you add -ES: noz (“nut”) becomes noces and vigués (someone from Vigo) becomes vigueses. * I think it’s a supreme irony that one of the greatest medieval Galician poets, King Alfonso X, was also partly responsible for sending Galician into obscurity centuries later. After all, he started the precedent of using Castilian—rather than Latin—in the royal courts and official documents, a trend that would eventually by the 1700s force people to learn Castilian Spanish for high society and relegate Galician as a country bumpkin kind of speech. * Lots of people have Castilianized last names although their Galician place-name equivalents exist (Feijóo vs. Feixóo and Triñánes vs. Triñáns). * Although only Galician place names are official, there still exist several Spanish forms like A Coruña (official/Galician) vs. La Coruña (Spanish variant), A Pobra do Caramiñal vs. La Puebla del Caramiñal, and Vilanova de Arousa vs. Villanueva de Arosa. * It would take a long time for me to fully master Galician because there are some words that are the same as in Spanish—paz vs. paz (“peace”)—some are different but that follow regular rules—galiña vs. gallina (“hen”), xente vs. gente (“people”), terra vs. tierra (“earth”)—and then there are some that are similar enough but you would never expect them to be different unless you knew the word already—garavanzos vs. garbanzos (“chickpeas”), tartaruga vs. tortuga (“turtle”). * The rare NG /ŋ/ sound shows up in unha (feminine form of “a”) and in words that end in -N like can (“dog”). * I think it’s very interesting that probably 99% of all Galician speakers by default also speak Spanish, just by virtue of being a minority language within Spain; there are almost no monolingual speakers of Galician. What implications this has for the language are important, but I’m not sure what they might be since I didn’t grow up here and don’t know what kind of code-switching, if any, goes on. * The fact of the matter is, I can understand spoken Galician—a distinct language—a lot better than I can Andalusian Spanish—a mere dialect of Spanish. Last year I really struggled just to understand the topic of conversation among the teachers at my school in Villanueva del Arzobispo as they rattled off chopped-off words at 100mph, but for whatever reason I can usually follow 80-90% of what’s going on in teacher meetings or lunch conversations here. Oh well. * As in Italian, ciao in Galician means “bye.” Whereas in the rest of Spain you might leave a store or restaurant, end a phone conversation, or greet someone in passing and say hasta luego, in Galicia you use the short-and-sweet chao. 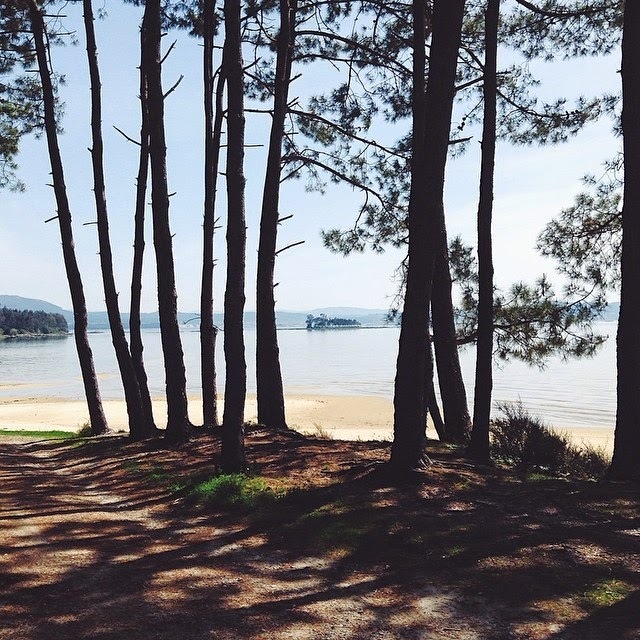 Can you think of any more interesting facts about the Galician language? How does this minority language sound to you? Comment below!